Laser rangefinders enable you to quickly and easily, with a push of a button, get accurate distance measurements. 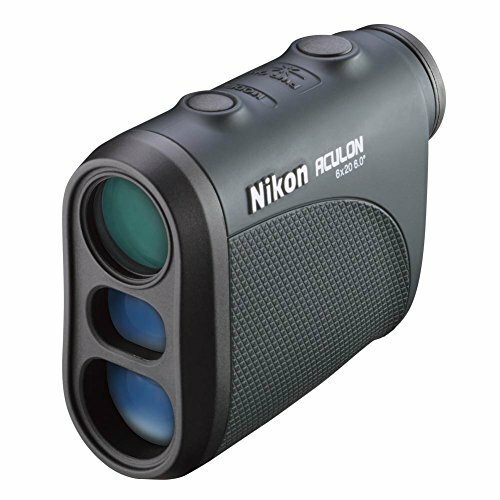 The Nikon 8397 Laser Rangefinder is our top pick. This reticle-crosshaired laser rangefinder is able to measure static and moving objects providing instantaneous readouts, from 6 yards to 550 yards. It has 6x magnification as well as a 20 mm objective lens, including a Distant Target Priority Mode which enables you to automatically assess the furthest target in a group of targets you are measuring. This is useful, for example, if you are measuring an object that is partially obscured by brush or grass. It ships with a carrying case and strap; a microfiber cloth; and a CR2 battery. Most users are satisfied with its portability, price and accuracy, and report using it for hunting and golf, most commonly. Let's take a look at five of the top-selling laser rangefinder's on the market today and see how they compare. The Nikon 8397 is a solid Laser Rangefinder that uses a compact design and delivers 550-yard range finding capability with Distant Target Priority Mode to help zero in on a specific target. In addition, its intuitive design coupled with multilayered optics and easy to read LCD display provides the user with an easy to operate yet sophisticated piece of equipment. Users of the Nikon 8397 have praised its value, pointing out the features its delivers at a competitive price. On the other hand, some users have pointed out that the 8397 struggles to find an accurate distance if it’s not held perfectly still. Overall, the Nikon 8397 is a very solid option for those looking for a compact and easy to use rangefinder that delivers good value. The general consensus of the Nikon 8397 from users is that this product delivers a good mix of value and sophistication. One user, who uses the Nikon 8397 for hunting, noted that the device is very accurate when employed to measure targets such as buildings, bushes, and trees, providing accurate readings up to 600 yards. Another user who bought the 8397 for golf despite some bad reviews, noted that the 8397 has been accurate on the golf range even in low light conditions. The overall view of the Nikon 8397 is that this is a very solid device that delivers great value for the price. 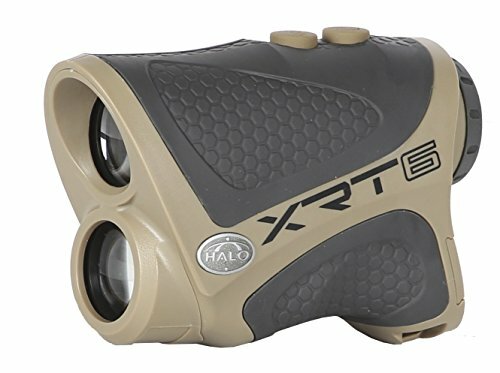 The Halo XRT6 Rangefinder is a good option for those on a budget who still want a capable rangefinder for hunting or playing golf. The XRT6 features an ergonomically friendly, compact design that is comfortable to use. The manufacturer claims this device can scan out to 600 yards and it has active scanning and AI technology, which allows for constant scanning and accounts for slope to target. Users of the XRT generally view the XRT6 as a solid device that delivers very good accuracy and reliability in an easy to use package at a low price. Some users, however, are critical of the XRT’s constant scanning function and the fact that the XRT6 lacks an autofocus feature. Still, user reviews for the XRT6 are very positive, giving value-conscious buyers a very good option for a capable laser rangefinder. The major strengths identified by users of the XRT6 by Halo are its accuracy and its ease of use. One user checked the accuracy of the XRT6 out to 300 yards and found the device was able to consistently meet the manufacturer’s specifications. In addition, this user was able to get a clear reading on building out to 400 yards and measure the distance to deer out to 250 yards. In addition, other users have found the display of the XRT6 to be very easy to read and 6X optical magnification was very helpful in getting a good view of the selected target. Critical reviews of the XRT6 were mostly centered around the constant scan mode and the Halo’s use of CRT-2 battery. The constant scan mode takes 20 seconds for the device to start scanning and will result in a shutdown of the device’s power after another 20 seconds. The CR-2 battery, although long lasting, is also expensive and can be hard to find. In all, the XRT6 is a great option for those looking for the most value for their money. The Yukiss R11-19060 rangefinder is a very effective laser rangefinder that features five different modes for use in a variety of conditions and rangefinding that extends to 1968 yards aided by 7x magnification and film coating that eliminates the need for reflectors or prisms. Users love the fact that the Yukiss comes with easy to understand directions and that the device is accurate to 1968 yards and provides a clear field of view thanks to the inner vision LCD display. The Yukiss 1960 is a very capable and feature-rich device that delivers top-notch performance for any use. The 1960 Rangefinder by Yukiss excels at providing accurate measurements in challenging environments from as far as 1968 yards. One user tested the device with a tape measure and found the device to be highly accurate even in low light dusk conditions. In addition, 5 mode capability coupled with 7X magnification delivers an impressive field of view that eliminates the need to search for your target. Some users noted the high price of the Yukiss and the fact that it is larger than some other similarly priced models, making the device more challenging to hold steady in some conditions. However, even with these limitations, the Yukiss received very high marks from a majority of users, making it one of the most capable units in this price category. The VPRO500 Laser Rangefinder is an advanced rangefinder specifically designed for golf by employing pin sensor technology to enable serious golfers to measure overlapping objects with a high degree of accuracy. Users of the VPRO500 like the accuracy of this model as well as the customer service provided by TecTecTec. Other users, although a minority, have criticized the VPRO500 for being difficult to use, and showing some inaccuracy due to the unit being difficult to hold steady. Overall, the VPRO is a very solid unit that offers great value and advanced functions at a reasonable price. In general, users of the VPRO500 enjoyed the ease of operation with this unit, the quick and responsive customer service, and the accuracy and speed in which the unit delivers the readings. One user noted how the 6X magnification and multi-coated optics, coupled with the pin sensor technology made for a very easy to read display that is superior to a higher priced model he used to own. Other users, however, pointed out the difficulty with the constant scan mode when the unit is not held perfectly still. The Bushnell V3 Jolt standard is a high-end laser Rangefinder for golfers looking for a highly accurate and feature-rich product that is also easy to use and has excellent build quality. Users of the V3 enjoy the accuracy and ease of use of the V3 due in large part to the Pin seeker and constant scan technology that is aided by the Jolt vibration feature. These features allow golfers without the steadiest of hands to get accurate measurements from as far out as 1000 yards. Some users have found that while the V3 is accurate, the 3-Volt battery drains quickly. Still, the V3 is a high-end rangefinder that delivers highly accurate readings in an ergonomic package. 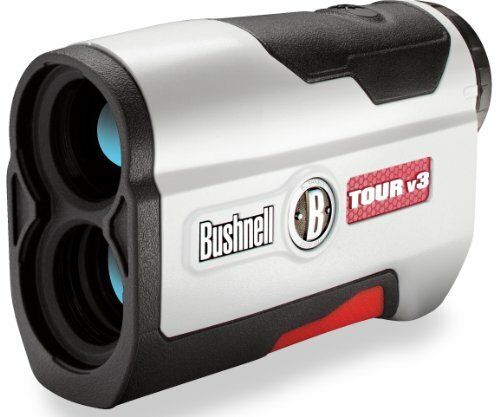 In general, users of the V3 Laser Rangefinder by Bushnell liked the advanced features of the model, especially the pin seeker technology, and the Jolt vibration feature. Users also lauded the V3 for its rubber armoring and rainproof construction that gives it a very solid yet easy to hold design. The biggest complaint was centered around the limited life of the 3-Volt battery used to power the Bushnell V3. A range finder is any instrument or device that can provide the distance between you, the user, and a visible point in the distance. Many rangefinders use laser or sonar technology and even very basic mathematical formulas to assess the distance based on the objects that are in view. The most popular type of rangefinder on the market today is the laser rangefinder- these types of laser rangefinder's are often referred to by the acronym: LIDAR. LIDAR stands for light detection and ranging. 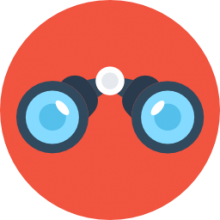 The way laser rangefinders work, is that similar to sonar rangefinders, they send out a laser beam to the target and the device measures the time for it to bounce back from the target. 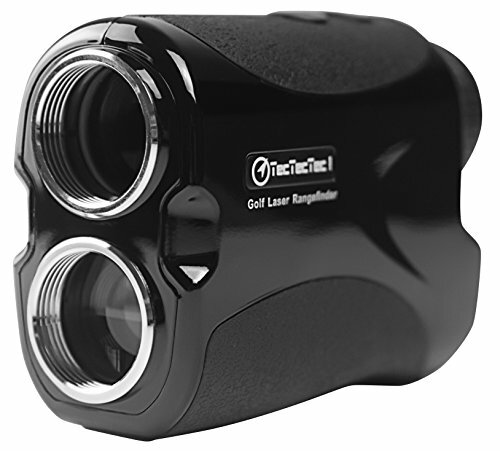 One drawback with laser rangefinders, is that if it is used on to great a distance they can generate inaccuracies because the laser beam will tend to diffuse. 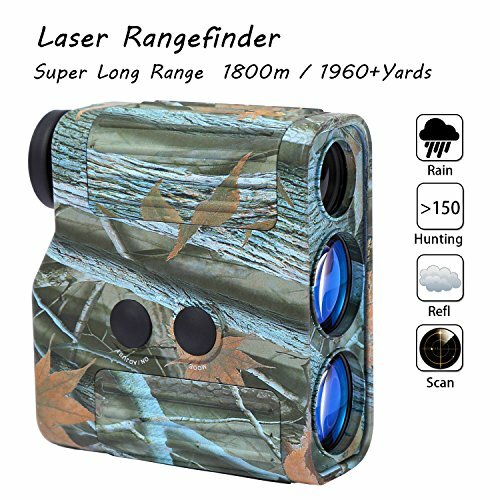 Some of the more advanced laser rangefinders, like the ones we have reviewed on this page, are able to assess multiple targets at the same time, providing all of the graphical measurements at once so that users can accurately determine distance to actual target. If you are considering purchasing a laser rangefinder, there are many applications that it satisfies. Perhaps you are a photographer or a golfer, or a hunter or general contractor- modern laser rangefinders are truly dynamic and portable options, with the ability to operate them with one hand merely by pressing a button to begin operation. A quality laser rangefinder will hopefully feature 6X magnification power, a 600 yard range, precision down to +/-1 yard, the ability for constant ranging mode as well as solid water resistance. Many deer hunters, no matter if they are hunting with rifles or crossbows, will use laser rangefinders to improve their hunting ability. Hunters describe wearing their rangefinders around their neck, having it hang to about their waist level, which enables them to be able to tuck the laser rangefinder into their coat pockets and quickly grab it to focus on their prey when they spot it. Many military professionals, including Navy SEALs, use these- some soldiers reporting that even after extensive use in the desert, when their rangefinders filled up with sand, the laser rangefinder just needed a solid cleaning out and they were back up and running. If you're looking to purchase a quality laser rangefinder, there are many available on the market today, with the Nikon being our top choice for its lightweight design, raving user feedback, quality design and accurate measurement.